HEFCE kept their word and published the final decisions on REF 2021 in the autumn. Having issued the initial decisions on the Research Excellence Framework 2021 in September, the final decisions were published this week. HEFCE released its further decisions on staff and outputs on 21 November 2017. These decisions have been informed by responses to key questions relating to staff and outputs and a survey of staff in scope for submission. This blog post provides a summary of the key decisions. Working with the REF 2021 main panels, HEFCE will provide further guidance on identifying staff with significant responsibility. This will be published in the guidance on submissions and panel criteria. This guidance will not prescribe a fixed set of criteria that all staff would be required to meet, but will set out a ‘menu’ of what HEFCE would consider may be appropriate indicators of significant responsibility. ‘Category A submitted’ describes the staff from the ‘Category A eligible’ pool who have been identified as having significant responsibility for research on the census date. Where the ‘Category A eligible’ staff definition accurately identifies all staff in the submitting unit with significant responsibility for research, the unit should submit 100% of staff. Where it does not accurately identify all staff in the submitting unit who have significant responsibility for research, institutions will need to implement processes to determine this and document this in a code of practice, approved by the relevant funding body with advice from the Equality and Diversity Advisory Panel (EDAP). The average number of outputs required per submitted FTE will be 2.5 (up from 2 outputs as previously suggested by HEFCE). A minimum of one output will be required for each staff member employed on the census date (as expected). A maximum of five outputs may be attributed to individual staff members (including those who have left) (down from 6 outputs as previously suggested by HEFCE). Data on the distribution of outputs across staff in the unit, including staff who have left, will be provided to the sub-panels for consideration in relation to the assessment of the environment. Output portability: A transitional approach is being adopted whereby outputs may be submitted by both the institution employing the staff member on the census date and the originating institution where the staff member was previously employed when the output was demonstrably generated. ‘Demonstrably generated’ will be determined by the date when the output was first made publicly available. This applies to the whole REF 2021 period. Open access: The REF Open Access policy will be implemented as previous set out. This requires outputs within the scope of the policy (journal articles and some conference proceedings) to be deposited as soon after the point of acceptance as possible, and no later than three months after this date from 1 April 2018. Due to concerns around deposit on acceptance, a deposit exemption will be introduced from 1 April 2018 and remain in place for the rest of the REF 2021 publication period. This will allow outputs unable to meet this deposit timescale to remain compliant if they are deposited up to three months after the date of publication. Submissions will include a total of one case study, plus one further case study per up to 15 FTE staff submitted, for the first 105 FTE staff returned (with a reduced requirement above this of one additional case study per 50 FTE staff). Submissions will therefore include a minimum of two case studies. For the latest information, see our REF 2021 webpage. Gain insight into how future outputs could be strengthened for REF2021. On Friday there was an exciting update from the REF Team based at HEFCE – they published the initial decisions on REF 2021. Whilst this does not include decisions regarding submitting staff, output portability or the eligibility of institutions to participate in the REF, it does include key decisions regarding the UOA structure, institution-level assessment, and the assessment weightings. The move of the impact template from the impact assessment to the environment assessment means impact will actually contribute to more than 25% of the weighting (see impact section). Assessment will continue to use the five-point REF 2014 scale (1*-4* and Unclassified). Underpinning research must have been produced between 1 Jan 2000 – 31 Dec 2020. Impacts must have occurred between 1 Aug 2013 – 31 Jul 2020. Environment data (such as income and doctoral completions) will be considered for the period 1 Aug 2013 – 31 Jul 2020. The assessment period for the publication of outputs will be 1 Jan 2014 – 31 Dec 2020. Each sub-panel will have at least one appointed member to oversee and participate in the assessment of interdisciplinary research submitted in that UOA. There will be an interdisciplinary research identifier for outputs in the REF submission system (not mandatory). There will be a discrete section in the environment template for the unit’s structures in support of interdisciplinary research. A reserve output may be submitted in these cases. Quantitative metrics may be used to inform output assessment. This will be determined by the sub-panels. Data will be provided by HEFCE. Harmonised definitions of academic and wider impact will be developed between HEFCE and the UK Research Councils. Academic impacts will be assessed as part of the ‘significance’ assessment of the outputs and therefore not in the impact assessment. Further guidance will be provided on the criteria for reach and significance and impacts arising from public engagement. Impact case study template will have mandatory fields for recording standardised information, such as research funder, etc. HEFCE will pilot this assessment in 2018 but it will not be included in REF 2021. The sub-panel chair application process is now open (details available via the link). The announcement does not include decisions regarding submitting staff, output portability or the eligibility of institutions to participate in the REF. There is ongoing dialogue between HEFCE (on behalf of the funding councils) and the sector regarding this. The letter (accessed via the link above) sets out HEFCE’s current thoughts on these points and invites the sector to feedback by 29 September 2017. BU will be providing feedback so if you have a view on this then please email me (jnortham@bournemouth.ac.uk). The four Main Panel Chairs for the next Research Excellence Framework were confirmed yesterday by HEFCE. The main panels will provide leadership and guidance to the sub-panels that undertake the REF assessment. As chairs designate, the appointees will at first advise the funding bodies on the initial decisions and on the further development of the framework. They will take up their roles as chairs later in the year*, once the outcomes of the ‘consultation on the second REF’ are announced and further appointments to the REF panels have been made. *Interesting to note that HEFCE have reaffirmed their previous commitment to announce the outcomes of the consultation later this year, despite rumours this would either be delayed or result in a second technical consultation. With the publication of the Stern Review last summer and the funding bodies’ Second Consultation on the REF earlier this year, there’s been a lot of discussion at BU and across the sector around REF 2021 lately. Despite this, and indeed because of this, we’re still none the wiser as to what the next REF will look like. Like many other universities, we are progressing with our internal preparations whilst we await the publication of the initial decisions from the funding bodies’ in response to the feedback to their consultation (predicted to be later this year). One of the ways BU is preparing is by running a stocktake exercise to see what outputs academic staff have published since 1 January 2014 and what potential impact BU research is having. Not only will this provide a summary of progress c. half way through the REF assessment period, it will also enable resources to be allocated to support further high-quality outputs and to accelerate research impact. Cohort 1 takes place this summer and involves UOAs – 2, 3, 4, 12, 22/23, 25, 34 and 36. Cohort 2 takes place this autumn and involves UOAs – 11, 17 (archaeology), 17 (geography and environmental studies), 19, 20, 26 and 29. The process will be the same for each cohort. On the outputs side, we are changing from individuals self-nominating for their inclusion in the exercise to a model where all academic staff (with a research-only or a teaching and research contract) are automatically included. This ensures the exercise is fully inclusive whilst reducing the burden on individual academic staff. 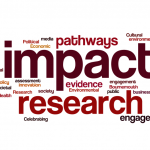 In terms of impact, we are changing from colleagues writing impact case studies to inviting them to attend a meeting and deliver a short informal presentation of their research, its impact and their plans for generating further impact, followed by a discussion with the panel. This is linked to the launch of the new impact tracker in BRIAN. The stocktake exercises are designed to be fully inclusive, positive and developmental. Further information about the REF is available on the Research Blog’s REF webpage. I just wanted to take this opportunity to introduce myself as the new Impact Champion for the Faculty of Health and Social Sciences. When I began my research journey several years ago I knew I wanted my research to make a difference. It is this on-going desire to make a difference which led me to pursue this role of Impact Champion. Part of my role is to take the lead in supporting academics to develop, maintain and ensure that research impact aligns with our core principle of ‘helping to make people’s lives better’. I will also be involved in developing impact case studies, and proactively accelerating impact in relation to REF. Please don’t hesitate to get in touch if there is anything I can do to support you in your research impact. A fortnight ago Prof Mark Reed, Professor of Socio-Technical Innovation at Newcastle University and the man behind Fast Track Impact, tweeted some thoughts on how to write a 4* paper for the REF. He went on to explain his thinking in more detail in a guest post on the Research Fundementals blog, the post is published here with the authors permission. Write to the criteria: when I was learning to drive, my instructor told me that in the test I should make sure I moved my head when I was looking in the rear view mirror, to make sure the examiner noticed I was using my mirrors. We’re all used to writing to the criteria of funding calls, and in fact we are all perfectly used to writing papers to the criteria of our target journals. In the last REF, research outputs were judged against three criteria: originality, significance and rigour. Whatever the interpretation of these criteria in your discipline, have you made it explicit to REF panelists reading your work exactly what is original, and why it is so original? Have you explained and effectively justified the significance of your work? And have you included evidence that your methods, analysis and interpretation is rigorous, even if you have to use supplementary material to include extra detail about your methods and data to get around journal word limits? Get REF feedback before you submit your work for publication: find out who is going to be reviewing research outputs for REF internally within your Unit of Assessment at your institution and ask them to review your work before you submit it. They may be able to make recommendations about how you might improve the paper in light of the REF criteria. Sometimes a little bit of extra work on the framing of your research in relation to wider contexts and issues can help articulate the significance of your work, and with additional reading and thinking, you may be able to position your work more effectively in relation to previous work to demonstrate its originality more clearly. Adding a few extra details to your methods and results may re-assure readers and reviewers that your approach is indeed rigorous. This is not just about doing world-leading research; it is about demonstrating to the world that your work is indeed world-leading. For me, these criteria are nothing new and are worth paying attention to, whether or not we are interested in REF. Meeting these three criteria will increase the chances that you get through peer-review and will increase the likelihood that your work gets cited. Analyse and discuss good practice in your own area: the only way to really “get your eye in” for REF is to actually look at examples of good and poor practice in your own area. Below, I’ve described how you can design an exercise to do this with your colleagues. You can do it yourself and learn a lot, but from my own experience, you learn a lot more by doing this as a discussion exercise with colleagues who work in your area. If you can, take notes from your discussion and try and distill some of the key lessons, so you can learn collectively as a group and more effectively review and support each others’ work. What makes good evidence of research impact? Join us on Friday 27 May at 12.00 to find out how to evidence impact from research in a session by Bokani Tshidzu, Chief Operating Officer of impact consultancy Vertigo Ventures. The session will outline the types of impact evidence that researchers can collect and online tools that can be used to gather this data. Attendees have an opportunity to consider the stakeholders involved in their research and find out how best to collect evidence of impact from different groups. There will also be a chance to find out more about the types of high-scoring evidence that was used in each panel during the last REF. The session will take place in Kimmeridge House (KG03) Talbot campus from 12.00 – 14.00. Light refreshments will be provided but please feel free to bring your lunch along. This session forms part of a series of research impact seminars and workshops, organised by RKEO to explore the various pathways to achieving societal and economic impact. Within the series, attendees will explore methods for effectively engaging a variety of research users throughout the research process, and develop new ways to plan, deliver and evidence impact. View the other events in the series or email Genna West for further information.